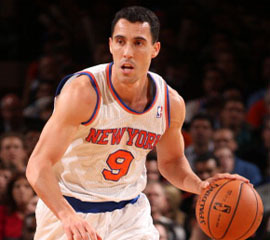 When Pablo Prigioni became the Knicks’ starting point guard on March 18, after the team lost four straight games, the team went on a 13-game winning streak. It was the best start for any rookie guard in NBA history, outdoing Danny Ainge who won 12 in a row with the Celtics in 1982. While Prigioni and the Knicks are interested in teaming up together again to continue that kind of success, the Argentine will do his homework before potentially re-signing. He has other initial interest in the NBA and abroad, and he’ll weigh those different offers come free agency. In a conversation with ESPNNewYork.com, Prigioni discussed his future, reflected on his first NBA season and shared some of his summer plans. Would you like to return to the Knicks? As you’re deciding where to play next season, what will be the most important factors for you and your family? How would you describe how your first season in the NBA went for you? What were your easiest adjustments, on and off the court, and biggest challenges? What do you think you guys were missing against the Pacers? Will you spend your summer in Alicante, Spain, where you have a home? How do you usually train in the offseason, and will you play with the Argentine national team? Is there anything new this summer that you would like to try for the first time? This entry was posted in Articles and tagged can the knicks keep pablo prigioni, KNICKS, knicks 2014, knicks free agent, KNICKS MEMES, Knicks news, new york knicks, pablo prigioni, pablo prigioni free agent, pablo prigioni knicks, prigioni spain on May 24, 2013 by Tommy Rothman.